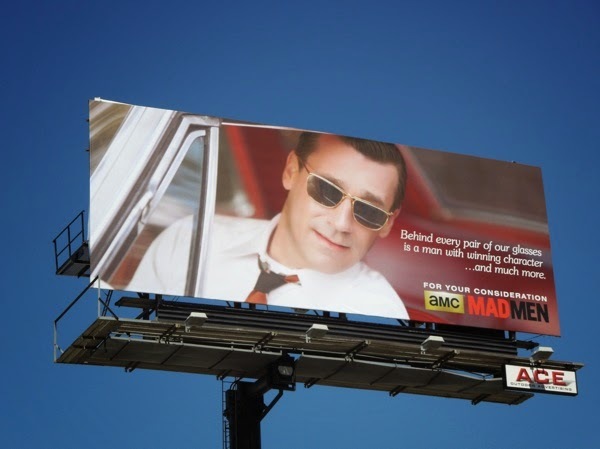 In an ad campaign worthy of Sterling Cooper itself, the Emmy Consideration campaign for Mad Men this year is a tongue-in-cheek affair, with more than pinch of flair and panache, which absolutely captures the spirit of the 60's period drama. 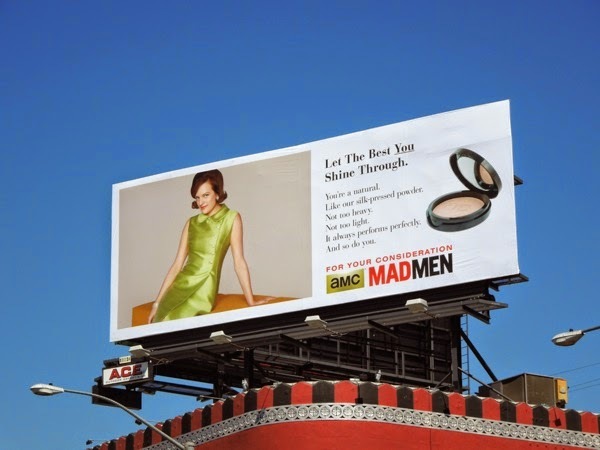 These vintage-style faux product ads were the brainchild of the show's creator Matthew Weiner and The Martin Agency, and sees all your favourite Mad Men characters in mock 60's adverts for sunglasses, hair dye, jewelry, makeup, clothing collections and more besides. 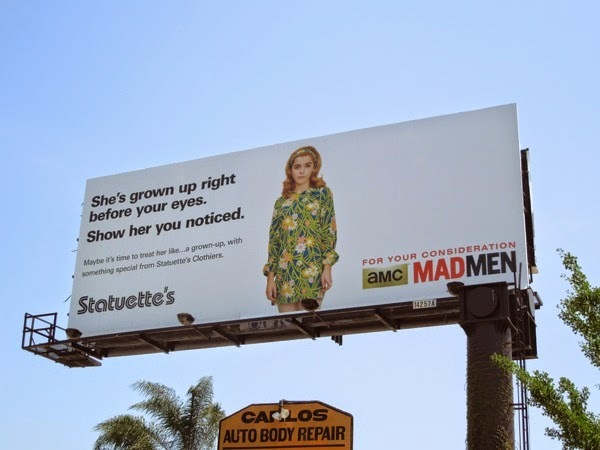 Passed over for the past two seasons after being named Outstanding Drama in its first four seasons, you can tell that the critically-acclaimed AMC show about a 1960's Madison Avenue advertising agency is enthusiastically pursuing those Emmy Awards now it's in the midst of its seventh and final season. 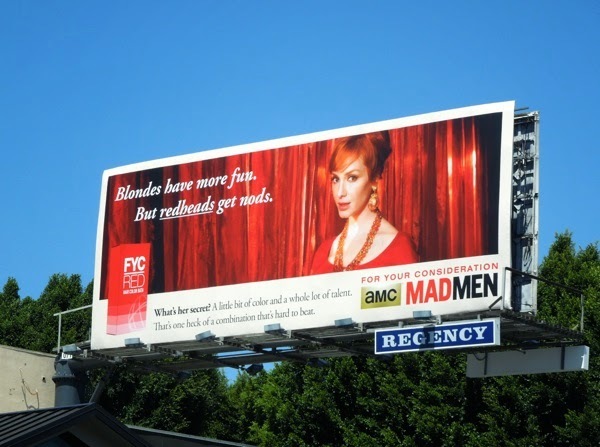 What's best about these fun billboard creatives is that they are totally on character, be it Christina Hendricks as the fiery redhead 'Joan Holloway' making a bold impression with her red hair dye, Kiernan Shipka as Don and Betty's Daughter, 'Sally', in a mod mini dress who has quite literally 'grown up right before your eyes' on the series and Jon Hamm smoothly modeling sunglasses as a charming man of mystery. 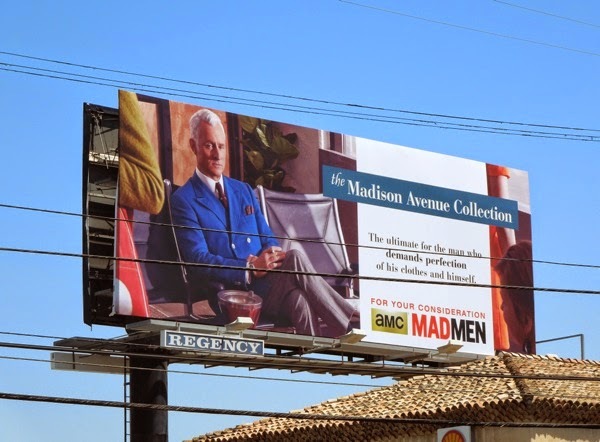 John Slattery as a stylish 'Roger Sterling', with cigarette in hand at an airport lounge for 'The Madison Avenue Collection' is priceless, Elisabeth Moss' journey as 'Peggy Olson' throughout the series if perfectly suited to the makeup powder concept and her transformation from shy secretary to confident creative copywriter, and January Jones 'precious metals' ad is spot on for the grass-is-always-greener 'Betty (formerly Draper) Francis'. 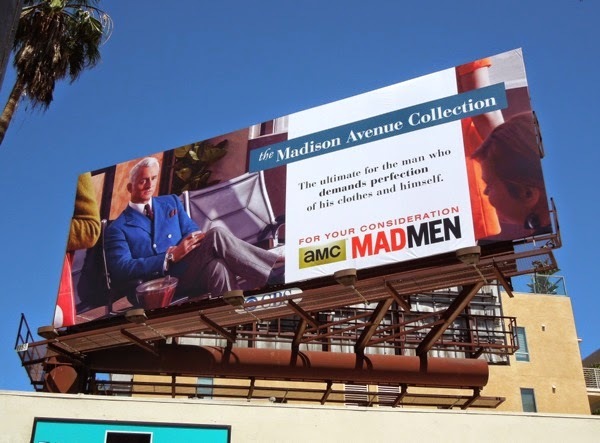 These For Your Consideration Mad Men Emmy billboards were first spied popping up along L.A.'s Sunset Strip on May 12, 2014, plus joined by more creatives in the days that followed further east along Sunset Boulevard, Beverly Boulevard, Highland Avenue and high over Vine Street in Hollywood. 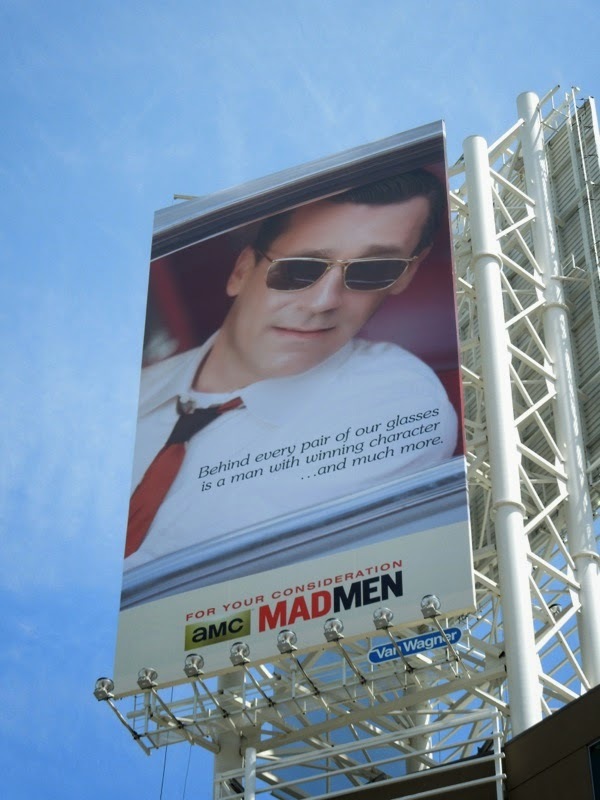 Daily Billboard also thought it was interesting that John Hamm had two billboards close to each other along the Strip for two very different projects, one for his new Disney movie Million Dollar Arm and one from this ad campaign. 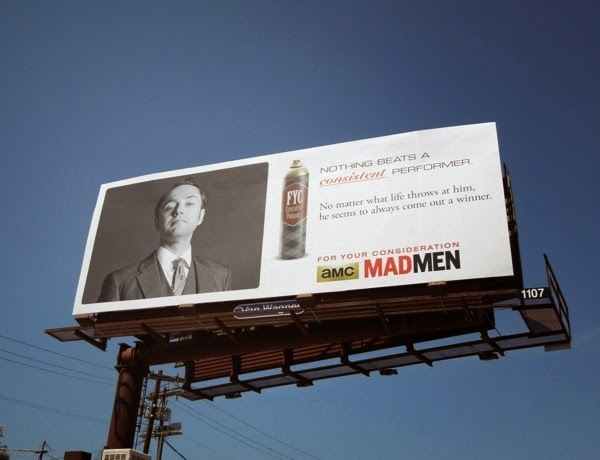 If you're a fan of the show, consider also checking out all these past Mad Men season promo billboards. 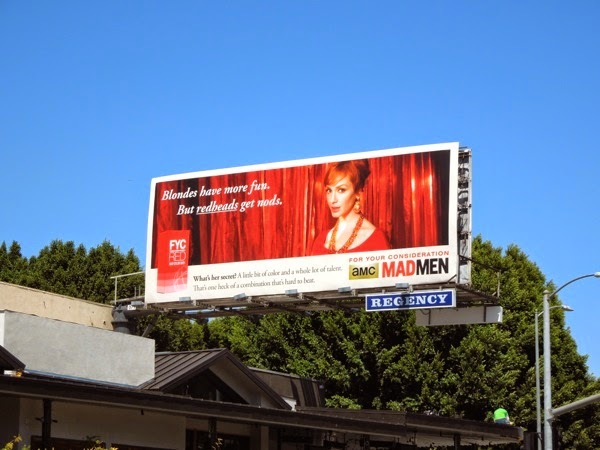 Daily Billboard loves these playful retro ads, but our favourite is Joan's striking billboard, as this redhead certainly knows how to turn heads and deserves more than a few nods (and Emmy nominations and wins too). 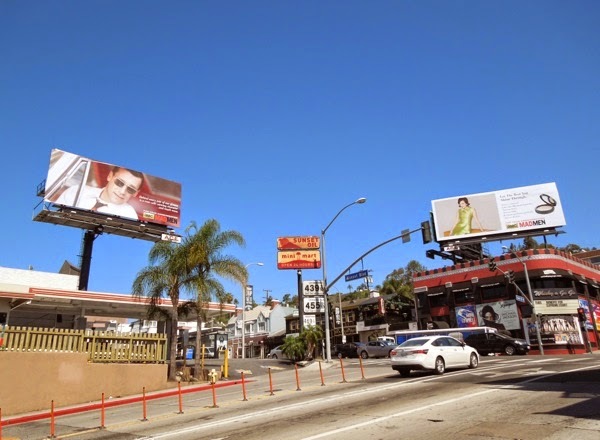 Stay tuned in the days to come for even more Emmy consideration billboards for your favourite TV shows appearing in the skies of L.A. at the moment. 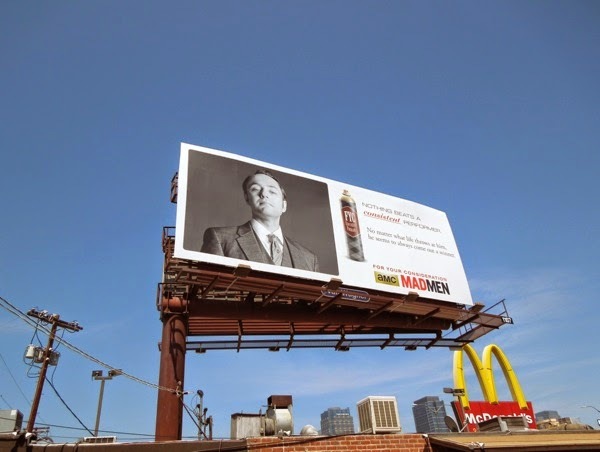 UPDATED: These retro-inspired Mad Men billboards are certainly capturing the imagination of passersby (and Daily Billboard's visitors, if web stats are anything to go by), so here's another creative execution that perfectly hits the mark, featuring 'Pete Campbell' (played by Vincent Kartheiser) advertising 'executive pomade' hair styling product. 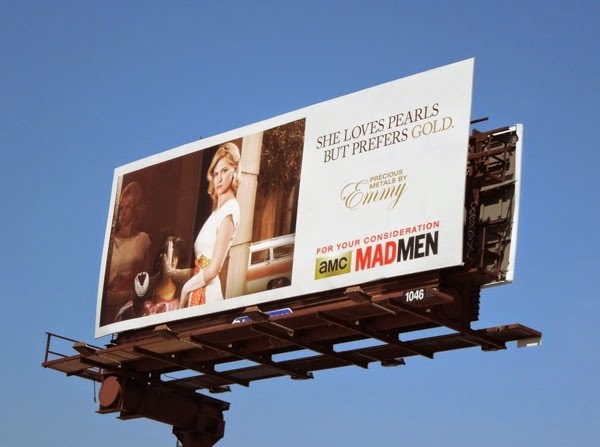 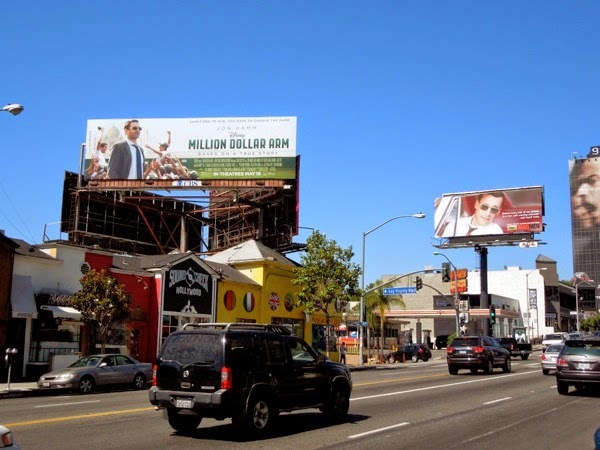 This Emmy nomination garnering billboard was snapped along Santa Monica Boulevard on May 27, 2014. 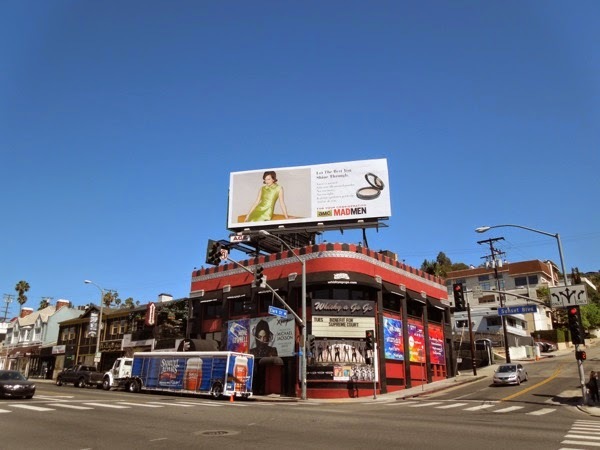 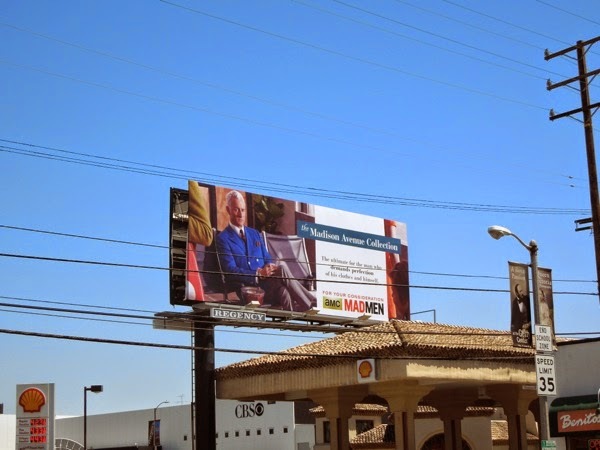 Plus here's an unobstructed view of another 'Roger Sterling' billboard recently added along Sunset Boulevard on June 3, 2014.